We are proud and delighted to inform you that Julia Roberts is supporting our joint campaign ! Last week, the Hollywood actress became the latest “Soilebrity” to help support the campaign and is following in the footsteps of other respected names, including the Dalai Lama, former Bishop Desmond Tutu, activist Vandana Shiva and conservationist Douglas Tompkins. As I am sure you would agree, the photo of Julia holding the sign will be very effective in getting our message across to the broad public. We therefore ask you, as a committed Save Our Soils partner to share the image on your Facebook page, Twitter and LinkedIn. Enclosed find the necessary campaign image. Please link it to www.saveoursoils.com. Just a quick reminder, we are currently encouraging as many people as possible to “ like” the Save Our Soils Facebook page (via the saveoursoil.com website) since each ‘like’ will release €5 from the Save Our Soils Fund, enough to save 500m² of fertile soil. 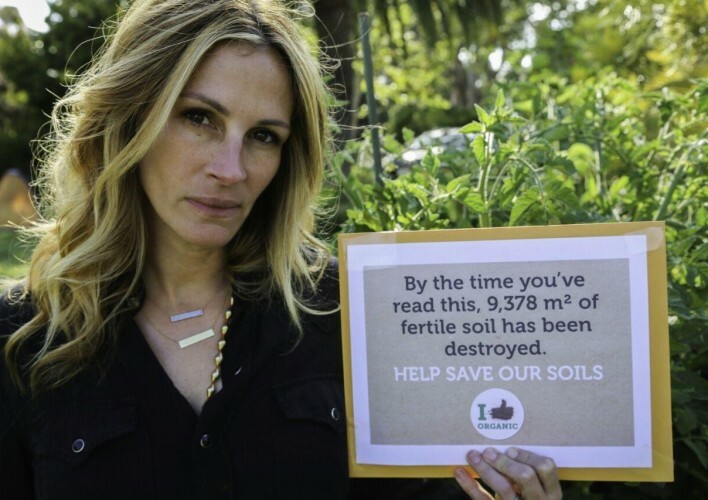 By sharing her picture, Julia Roberts is not only encouraging consumers to join the campaign but also to buy soil friendly, sustainably farmed products.